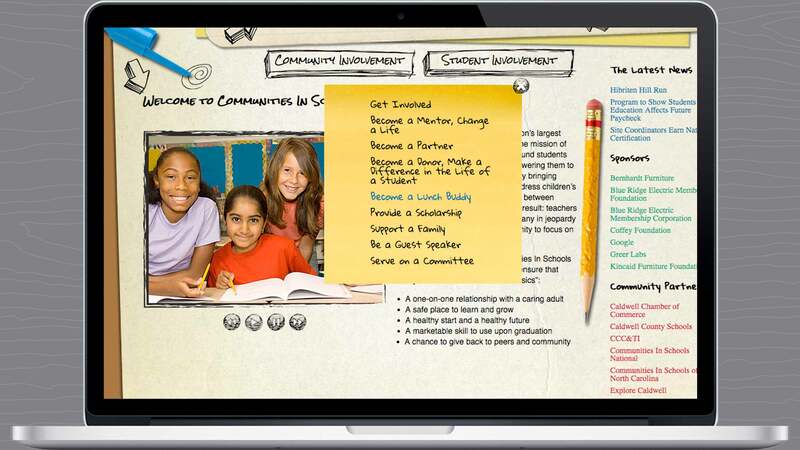 Communities In Schools is the nation’s largest dropout prevention organization. The mission of Communities In Schools is to surround students with a community of support, empowering them to stay in school and achieve in life. The main objective of this redesign and relaunch of the Communities in Schools of Caldwell County website project was, to provide one effective and easily organized way to present information to two main audiences; community volunteers, supporters and donors, and students reaching out for help. 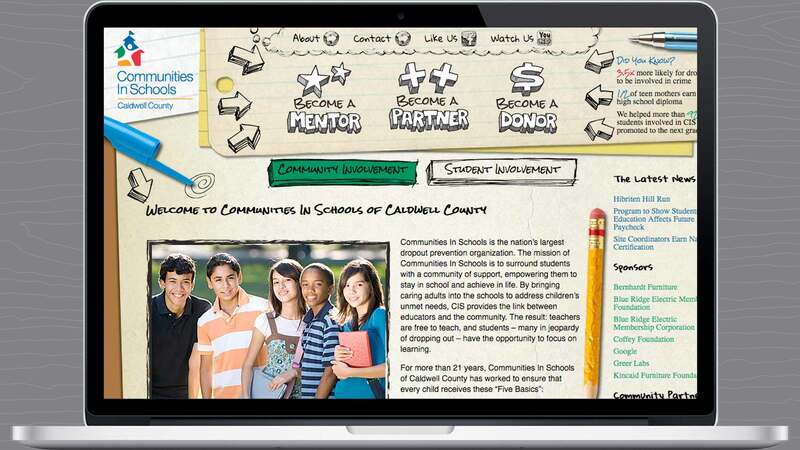 This website redesign and relaunch gave Communities in Schools of Caldwell County a brand new presence online, with a more robust tool for their needs. An easy to operate and thorough content management system became the foundation of the website to give the client 100% access to managing their website and all of their content, a service that wasn’t available for their old website. From there, the architecture of their old site was completely altered, reorganized and restructured to effectively provide the user with a more logical, easier and organized manner to locate content and receive the CIS message. Next, community-specific and student-specific sections for most events, programs and information were added, which greatly enhanced the chance of content being pursued from both audiences. 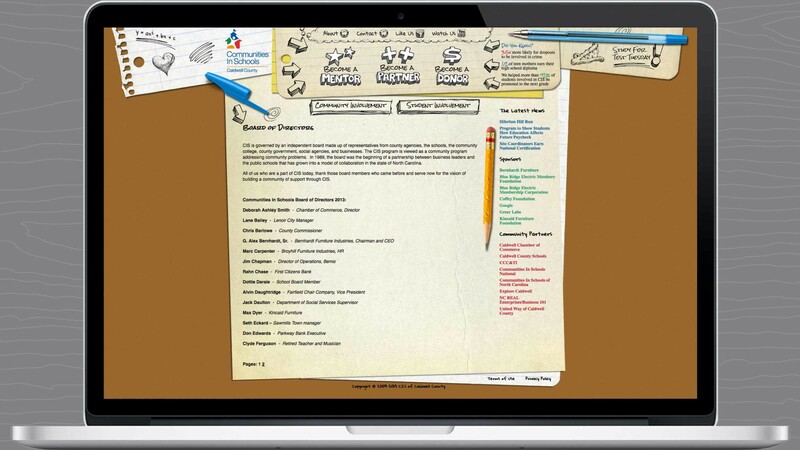 And finally, the website’s look and feel was created to make the user feel as if they were interacting with a school desktop, as seen through the eyes of a student. To achieve this user experience, the website design included hand drawn navigation buttons, icons and flourishes. 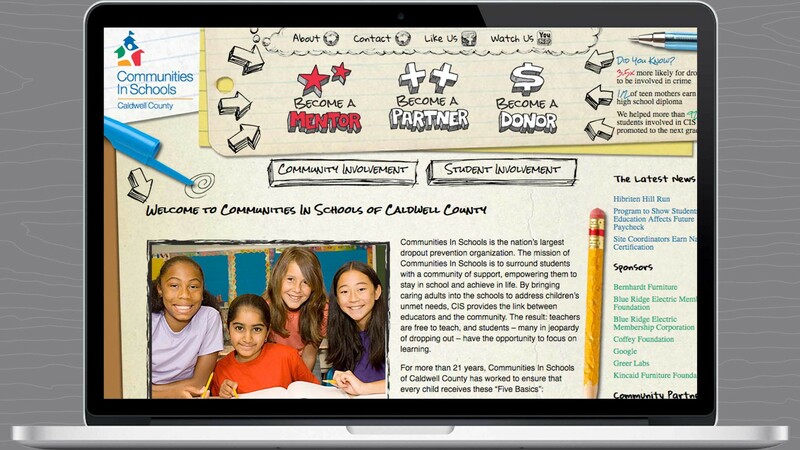 The Communities in Schools of Caldwell County website redesign and relaunch can be viewed at ciscaldwell.org. 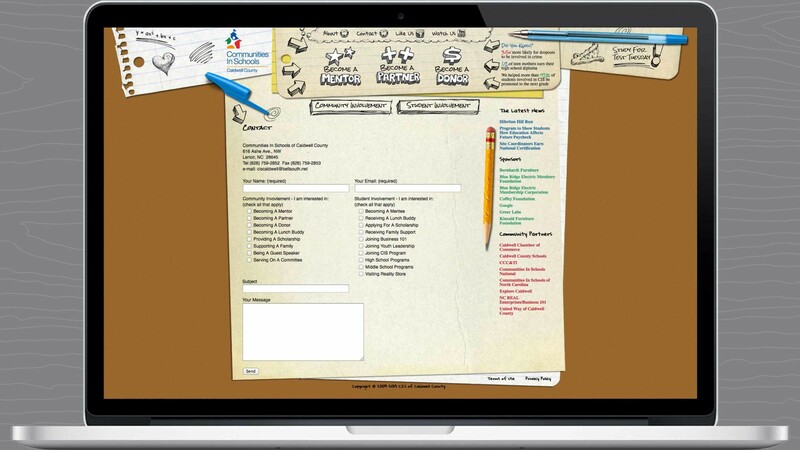 Full views above of the Home, Board of Directors and Contact pages from the redesigned and relaunched Communities in Schools of Caldwell County website. Full views above of the hand drawn Become a Mentor, Become a Partner, Become a Donor, Community Involvement and Student Involvement navigation buttons. In addition, hand drawn sub-navigation buttons, theme icons, doodles and flourishes are also shown within the website full views. 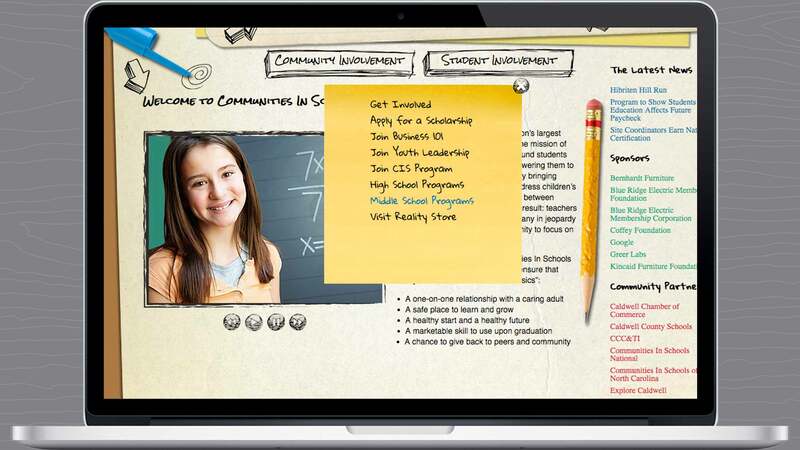 Full views above of the Community Involvement and Student Involvement sub-navigation menus, completed in a Post-It note style with hand written looking fonts.